The story of Wedgwood School at 2720 NE 85th Street shows how dramatically the population of the neighborhood increased after World War Two ended in 1945. Wedgwood teemed with young families and children during the post-war “Baby Boom” years, and the school district scrambled to build more schools for them. 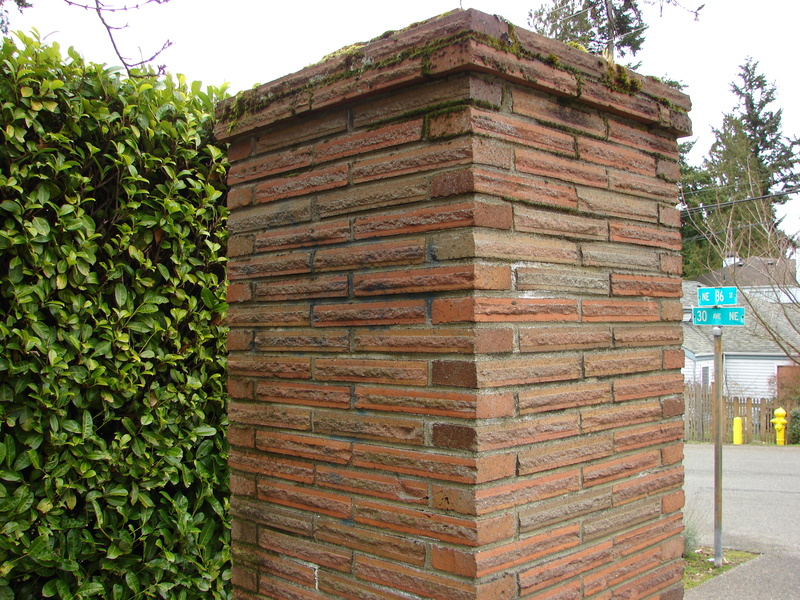 The brick gatepost on NE 86th Street at the corner of 30th Ave NE marks the entrance to Balch’s Wedgwood #4 section of housing. During the 1940s real estate developer Albert Balch completed his original group of Wedgwood houses from NE 80th to 85th Streets, 30th to 35th Avenues NE. The charming development set in curving streets, screened with tall trees, attracted young couples starting out with their first homes. The name “Wedgwood” caught on in popularity and spread to become the name for the whole neighborhood. By 1950 Balch was looking for more land to meet the demand for more houses. He bought a former country estate on NE 85th Street at 30th Ave NE and platted it as Albert Balch’s Wedgwood #4. He had already started building houses in the plat when the school district decided it would be better-used as the site of the new Wedgwood School. 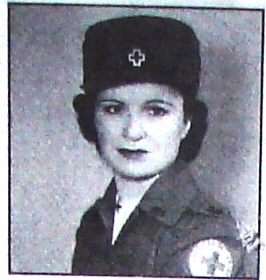 Alberta Stone in her wartime Red Cross uniform. Homer and Alberta “Bertie” Stone met as students at the University of Washington in Seattle, and married in May 1941. On December 7, 1941 the attack on Pearl Harbor sent the United States into full-scale war and the Stones, like many other young couples, had to put their lives on hold. Homer served in the military through the war, and Bertie was a Red Cross social worker. After World War Two ended Homer and Bertie began to fulfill their dreams of domestic bliss. They found a nice apartment across from Green Lake for $35 per month rent. They were shocked when friends of theirs paid $4750 to buy one of Albert Balch’s houses on NE 82nd Street in the new Wedgwood development, as that seemed like a lot of money. But when Homer and Bertie visited their friends in their new house, Homer and Bertie fell in love with Wedgwood as their friends had done. Finally in 1951 the Stones joined the Wedgwood community in a house that had been built for them on NE 86th Street just west of 30th Ave NE in Balch’s plat of Wedgwood #4. Homer and Bertie Stone looked forward to the time when their two daughters would attend the new school which they had heard that the school district would build somewhere in the neighborhood. Only a few months after moving into their new house, the Stones were notified that the site of their house was to be taken for the new school! During the years of World War Two Americans had accepted many restrictions, such as rationing of food supplies, in order to contribute to the goal of supporting the troops. After the war, people were tired of restrictions but they still accepted some kinds of government decisions for the common good such as the taking of property by “eminent domain.” Eminent domain is the power to take private property for public use, such as for a highway, park or school. An example of eminent domain in Wedgwood is the story of Dahl Playfield. The city decided to take that area for a playground, and the homeowners who were living on the site were compensated for having to move their houses. When Homer and Bertie Stone were notified that the school district would take over their property, the Stones were upset but they accepted the need to have a place for a new school. Theirs was the typical attitude of people who had lived through World War Two: they were used to sacrificing their own desires for the greater good of the community. The King County Tax Assessors photo of the Robinson house in its original location, with the old address crossed out after the house was moved. On the left can be seen part of the brick house belonging to Homer and Bertie Stone in its original location. Photo courtesy of the Puget Sound Regional Archives. Homer and Bertie Stone’s house was one of four located near the intersection of 30th Ave NE and NE 86th Street on what is now Wedgwood School’s playground. Two of the houses dated from the 1920s and the original property owner, Leonard DeVries, an attorney who worked downtown, still lived in his house. He had sold the rest of his five-acre property to Albert Balch, the developer, with the stipulation that Mr. DeVries would retain his home. 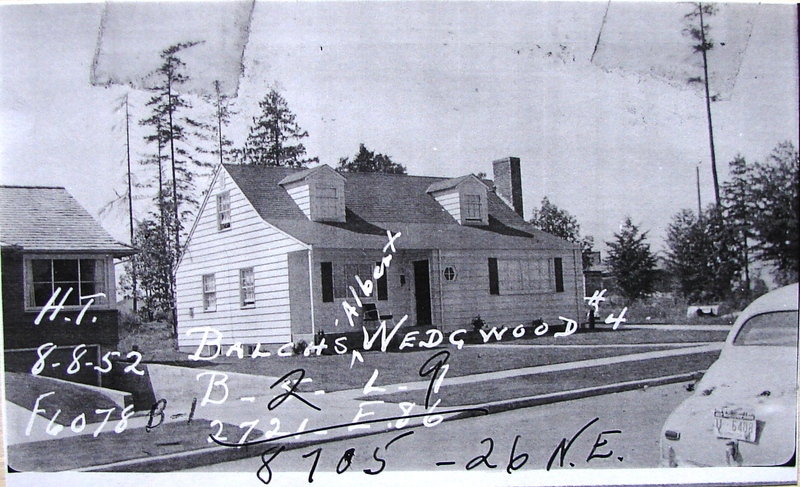 Albert Balch had already built two new houses, one for Ed and Mary Robinson and one for Homer and Bertie Stone, near to the two older houses belonging to the Jones family and to Mr. DeVries, when word came that the Seattle School District would take the entire tract for the site of the new Wedgwood School. 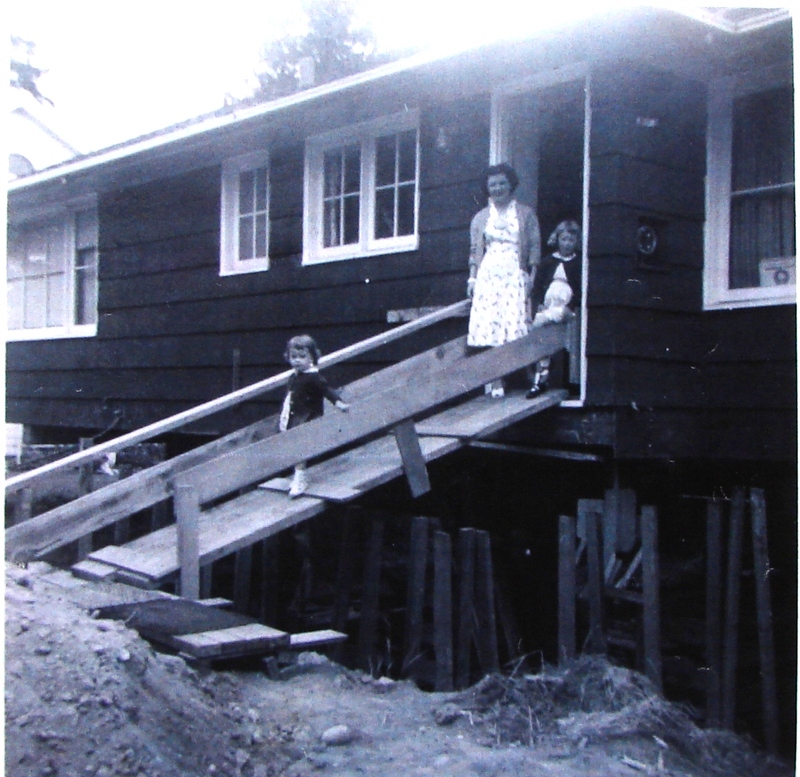 The Stone’s house at its new location of 8304 28th Ave NE in 1953 after all work was completed to set it in place. On the right is the white carriage house belonging to the next-door neighbors, the Mattocks. Photo courtesy of the Puget Sound Regional Archives. The Stones decided to move their house, and they had to search on their own to find a place to move it. The Stones scoured the neighborhood to find a nearby vacant lot. They wanted their girls to continue to attend Wedgwood School, and they also knew that the cost of the house-moving was partly to be calculated according to the distance of moving, so they sought a nearby site. The Stones found a nearby vacant lot which belonged to the Mattocks family of 8234 28th Ave NE, who had kept the lot next to their house as a vegetable garden. It took some pleading and persuading to get the Mattocks to sell the property, but Mrs. Mattocks later acknowledged that gaining good neighbors was worth losing a good garden! Although losing their house site was very upsetting and inconvenient at the time, in later years the Stone family liked to joke about Homer Stone’s heritage of house-moving. When Homer was growing up, his parents’ house had also been moved. The house, built in 1915, had been at 4215 Aurora Ave North. In those days Aurora was an ordinary city street but when it was chosen to become the arterial US Highway 99, Aurora Avenue was widened and houses along Aurora either had to be moved out of the way or torn down (another example of the taking of property by eminent domain.) In 1931 Homer Stone’s parents moved their house to 4122 Linden Ave North, where it still stands today. The work was done by the Davis house-moving company, and, twenty years later, Homer Stone engaged the same company to move his own house to its new site at 8304 28th Ave NE. After moving the Stone’s house, it took a long time to finish the basement and foundation, and hook up the house to utilities. Photo courtesy of the Stone family; do not copy without permission. To prepare for moving day, the brick facing of Homer and Bertie’s house had to be taken off to lighten the load. The bricks were gathered up and used to create a patio in the backyard of the new location. The Davis Company promised that the moving would be so smooth and gentle that nothing inside the house would need to be packed up. Mrs. Stone did, however, put away some breakable items and she secured the kitchen-cabinet doors. Mrs. Stone was allowed to ride in the house while it was moved. She sat in a living room chair with her youngest daughter on her lap, waving out the window at neighbors who stood along the roadway watching the progress of the house-moving. After the house was set in place, work began to build a new basement. The Robinson house was moved to 8705 26th Ave NE. The Robinsons, owners of the other new house in the doomed Wedgwood addition, were able to find a place to move their house, to 8705 26th Ave NE. Finally, the two older homes were moved over to NE 85th Street on the east side of 30th Ave NE. 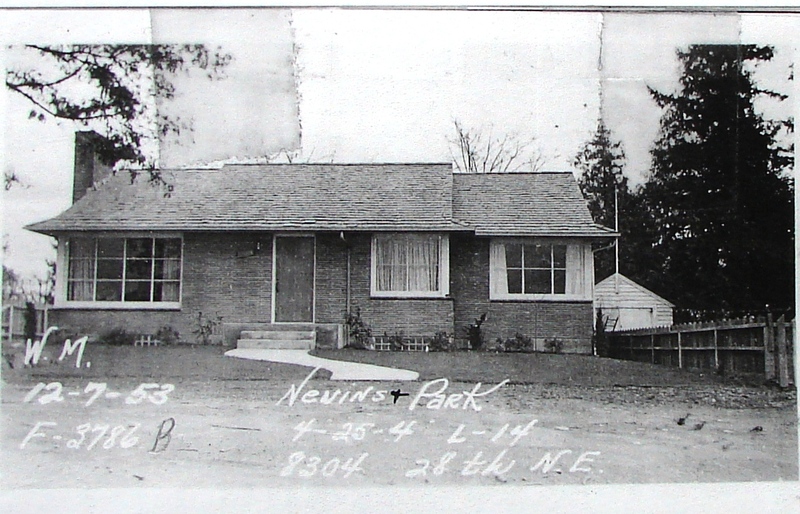 Mr. DeVries’ house (1926) still stands at 3000 NE 85th Street, and next to it is the Jones home (1928) at 3010 NE 85th Street. Mr. DeVries’ house is the “movingest” house in Wedgwood because it was moved twice. When he sold his estate property to Albert Balch, Mr. DeVries moved his house over to face 30th Ave NE so that Balch could build on the rest of the land. When the school district took all of the property, Mr. DeVries eventually did move his house for the second time but only after delaying the process for some months. Perhaps because he was himself an attorney, Mr. DeVries engaged in sharp negotiations about compensation for moving his house. Mr. DeVries’ house, built in 1926 and shown here with its old address, was on the site of Wedgwood School. Now the house is at 3000 NE 85th Street. Other delays in acquiring the land to build Wedgwood School included resistance to the school plan from the King County Planning Commission. As of 1952 the Seattle City limits were still at NE 85th Street. Since the proposed property of Wedgwood School was on the north side of the street, technically it was in unincorporated King County. The King County Planning Commission refused to issue a building permit for the site. The board of Seattle Public Schools knew that the Seattle City Limits would continue moving northward, but in the meantime they were forced to just wait. As of March 1, 1953 the Seattle City Limits were moved out as far as NE 125th Street. Then the school district was able to get a construction permit from the City of Seattle and go ahead with the building plans. 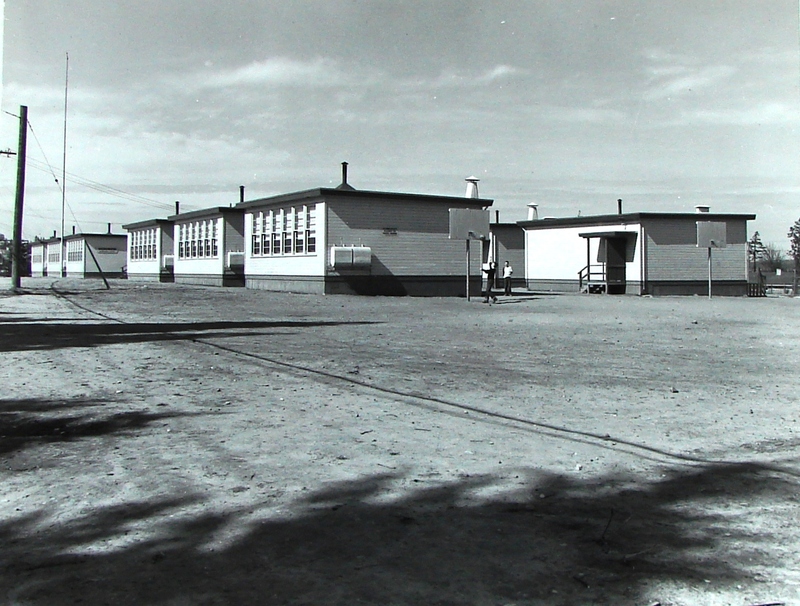 Wedgwood School opened in 1953 with all-portable classrooms while the permanent building was under construction. School construction had not yet begun, but there were so many children that the school had to open without a permanent building. Wedgwood School opened for the first time on September 30, 1953, three weeks late while the work of setting up sixteen portables was done. Twelve of these were classrooms and the other four portables were for supplies, office and teacher’s work area, and lavatories. The portable classrooms were set out on what is now the school playground, while the permanent building was under construction. That first year, more than 400 children attended Wedgwood School in kindergarten through fifth grade. Some of the classes were double-shifted with one group attending school from 9 to noon and another group from noon to 3 PM. Kindergarten classes were triple-shifted from 9 to 11 AM, 11 to 1 and 1 to 3 PM. 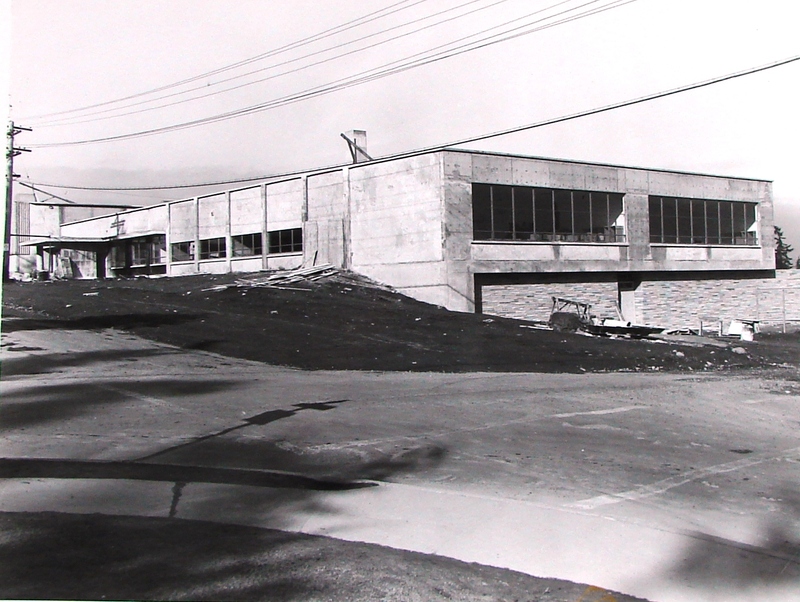 Wedgwood School as it looked when completed in 1955 at the intersection of NE 85th Street and 30th Ave NE. The Wedgwood School building was finally finished and ready on June 1, 1955, just two weeks before the end of the school year. On the move-in day many students brought little red wagons and celebrated with a grand parade of wheeling their books and supplies into the new Wedgwood School building’s twenty-two classrooms. By the beginning of the new school year in September 1955, more than 800 students were enrolled at Wedgwood, with many students transferring in from Maple Leaf School on NE 100th Street, as well as the overcrowded Bryant and Ravenna Schools. Just before the end of the school year in June 1955, Wedgwood School students helped move books and supplies from the portable classrooms into the newly completed building. Article of June 1, 1955 in the Seattle Times newspaper. This entry was posted in School histories and tagged 1950's in Wedgwood, 1950s Baby Boom, Balch's Wedgwood #4, eminent domain, house-moving, Neighborhood History, Seattle, Wedgwood School in Seattle. Bookmark the permalink. I reallly had no idea that moving houses was so commonplace. I love the detail of Mrs. Stone waving to the neighbors from her moving house. In fact, I love all the little human details of this history lesson. I wouldn’t even ride in our fifth-wheel while we were traveling, let along in a house going down the street. Thanks for the memories of people’s lives there in Wedgwood.